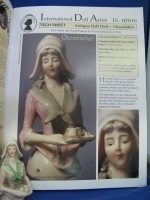 The chocolatier is a rare and unusual half-doll taking its roots fron the chocolate and cocoa era of the 18th century. Mon'Amie' along with Uta are considered original mignonettes. This lovely French doll uses size 3 eyes. She is in a set with our SFBJ 301. 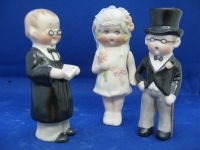 Three cute little figurines from the 1930's that stand approximately 3 3/4".They were featured in the summer 2012 issue of The International Doll Artist Magazine. Something Fancy Inc. ©Copyright 2019 Something Fancy Inc.